AzBaja.com, Home of the VW Baja Bug -:- Baja Forums -:- AzBaja.com Members -:- New Members -:- Hey you! New guy! Baja Forums -:- AzBaja.com Members -:- New Members -:- Hey you! New guy! Post subject: Hey you! New guy! Post subject: Re: Hey you! New guy! Hey everyone i am totally new to just about everything baja. i just recently purchased a baja from cr a few weeks ago and am loving it. However i am having problems getting it tuned just right so i can start driving it to work instead of my truck. i have posted in engines and transaxels if any one wants to read it and help out. About myself i am 26 years old and live in tempe my name is stewart and wanted to get into the baja sport as a hobby and a way to spend some of my spare time. I will try and figure out how to upload a photo of my 1973 baja with a 1776 motor full cage race fuel tank as well as fiberglass front end, boxed arms in rear with pulled bilsten shocks. p.s i have no clue how to upload a photo to this post. Since then ive rebuilt FIAT X19/S - and rebuilt motorbikes and redone bicycles.. Welcome to the site & Welocme to the site. 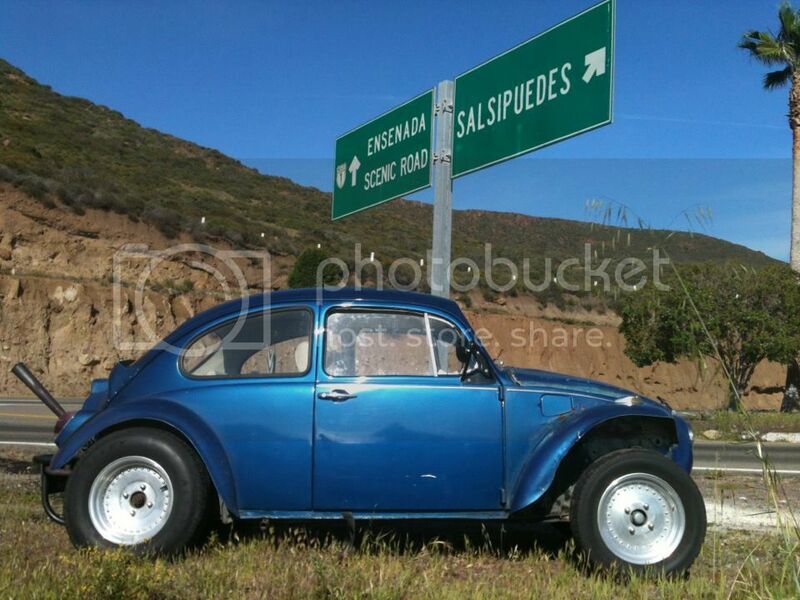 Hows it going I have a 1974 VW Bug standard I am turning into a Baja. I am brand new to all of this. Today I traded some of my stock parts for fiberglass hood and some front fenders. I was wondering if anyone knows a good cheap website for a baja front apron or any other modifications I could do besides that. Look up VW Baja in a Weekend on youtube under AzBaja. It was a quick and simple build. one day to build one day to paint then the VW show the next weekend. I looked for it on You Tube I did not see it? Yes, I forgot what it was called. it is VW Baja in a Weekend. This was done on the cheep. We spent the most money on red paint every thing else was jsut low budget and extra parts on hand. I am eric 31 currently live in Montanna . My wife and I will be moving to Benson Azi. I have mostly built rock crawlers lifted jeeps Toyota's . I am finishing up a GMC Sonoma with Toyota axles. About 2 weeks ago my friend called me up and asked if I wanted a VW to cruze the desart with. Next thing I know I own a 66 Giha. Hello guys, here is my ride, just bought it about 40 days ago while I was in California from a bud of mine from our VW club there in San Diego, and moved to Az. this past Sunday. Will start to work in Tempe this coming Monday 4/29, and looking forward to be involved in the VW scene here in Az. I am new to having an interest in Baja vehicles. Well, that's sort of accurate. I have always liked Baja vehicles, but have never thought to try my hand at building one. I am here to learn about the process. I currently own a stock Chevy Colorado with the 5 cylinder. It now has 90k+ miles on it, so I was considering converting it to a Baja vehicle, rather than looking for a bug (though Baja Bugs are pretty sweet). Maybe someone could take the time to guide me to the right page to get started on understanding what is required to transform my little truck into an off-road monster.